That’s why it’s so refreshing to see Material Design for Bootstrap – a powerful and free Material Design UI kit. 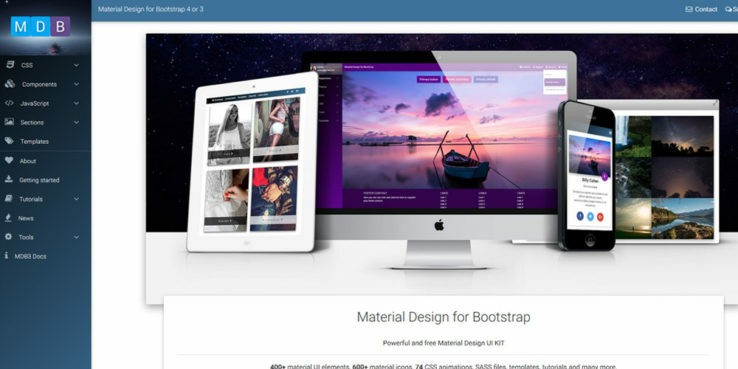 They have combined the power of Material Design with the familiarity of the Bootstrap front-end framework. With it, you now have the ability to add Material Design elements to your website using an existing (and very popular) tool. Developed by Google, Material Design is a “visual language” that aims to create a consistent user experience across platforms and devices. Not only that, it seeks to bring many of the principles of good design that we’ve seen in print publications for years to the web. Provide visual cues to help users quickly understand how to interact with your website. Use elements such as whitespace, color and typography to create hierarchy, meaning and focus. Use motion in a meaningful and appropriate way to enhance user actions. Material Design is a 3-D environment, so use of shadows and ambient lighting are important for creating depth.